Our first epic workout of our road trip took place at Spring Lake Regional Park in Santa Rosa, CA. We had walked along its paths, featuring views of Spring Lake and Lake Ralphine, and afterwards ate our sandwiches we made from our cooler supplies mid-day; we enjoyed the outdoor scenery and light exercise. 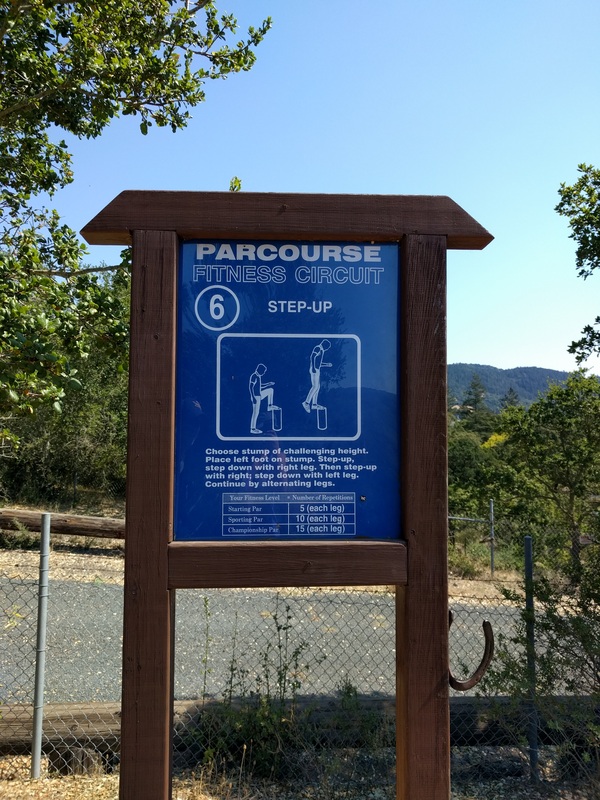 We engaged in several of the Parcourse Fitness Circuit exercise stations (there are 18 total) for fun as we stumbled upon them while walking around Spring Lake. 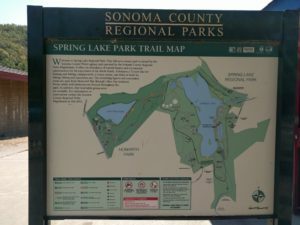 We had initially decided to return the following day to mix up jogging the 2.3 mile loop around Spring Lake with stopping at the each of the exercise stations, but we made the spur-of-the-moment decision at a happy hour in the late afternoon to skip out on another happy hour to engage in this unique, local workout opportunity, since we were both strongly craving a challenging exercise session! 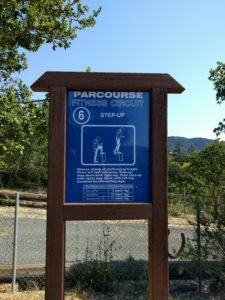 Each workout station featured written instructions, illustrations to demonstrate how to perform the exercise, and suggested repetitions based on self-gauged fitness level. Of course, we aimed for “Champion Par” of the three levels of options presented, being the avid fitness enthusiasts we are, but listened to our bodies when needed based on our individual abilities. It was fun and certainly different from our typical workout routines, which have always been separate until now (unless we’re hiking, biking, or walking for an outdoor activity). 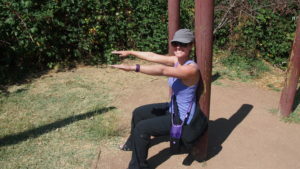 There were upper body, lower body, core, and stretching stations throughout the parcourse. 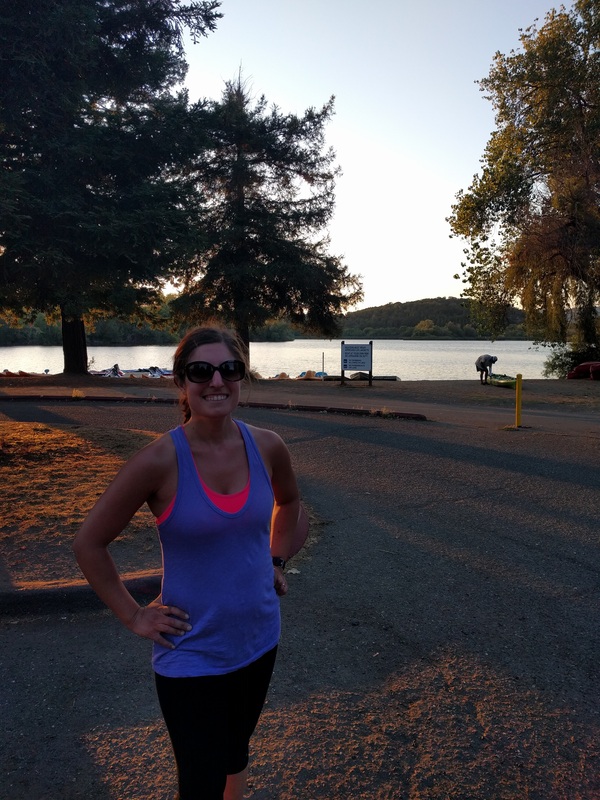 I am not acclimated to running outdoors, and I’m not even a runner for that matter. I’ve gone through periods of time in my life where I’ve enjoyed running on a treadmill and incorporated it into my workout regimen regularly (1-6 times per week, depending on my season of life), motivated by its benefits. I love engaging in the focused, controlled breathing pattern, striding at a steady pace, pushing myself further by the beats of my music and positive, internal self-encouragement. I’ve felt such accomplishment with my gradual progress as I’ve increased my running distance and lowered my per-mile pace over time, and for the results I’ve seen in my physique and fitness level as a result of running regularly. 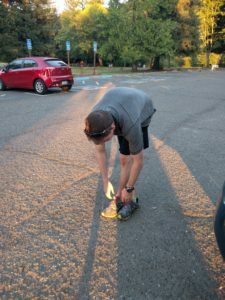 I went through a semester in college where I ran 5+ miles nearly every day and loved it; how it made me feel and how I could do it and sustain it. It helped me build my individual self-confidence in a time of growth and development for me, when I really needed it in my personal life. I went through other periods afterwards where I’ve used it to complement other types of exercise in my workout regimen, committing to 1-2 runs per week for 3+ miles. Unfortunately, I’ve injured myself twice running (foot and ankle) in my last couple of trials in more recent years to build upon and increase my running frequency and duration. As I get older, I feel the impact it has on my body when I do it (after all, it is a high impact exercise activity). Both of my hips get sore with every stride at some point, usually felt after running a few miles. If it doesn’t happen while running, I usually feel it within a couple of days to follow my running session while walking. As much as I’d like to be able to train for and run a half marathon someday, which was on my bucket list previously, I’m choosing to listen to my body instead; I’ll be pleased to run a 5k or 10k in my lifetime and feel successful. My body and its mechanics just aren’t made to run longer distances sustainably for me, and that’s okay! 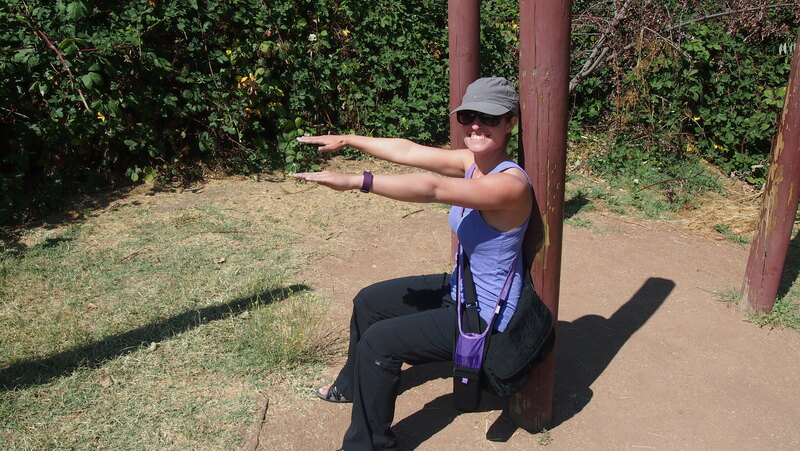 There are so many other physical activities I enjoy and would like to continue engaging in (not to mention, teaching! ), and in order to be able to do so long-term, I need to not run to the point, and beyond, where I feel pain in my hips. With that being said, I pushed myself beyond that point in this workout. I was so excited to finally have a dedicated opportunity to exercise, and I didn’t know when I would get my next opportunity while on the road, so I wanted to maximize my time doing it until I was utterly pooped! Also, after one loop around the lake together, broken up with the 18 parcourse stations, I knew Aaron wanted to run more, so I was game for more exercise. 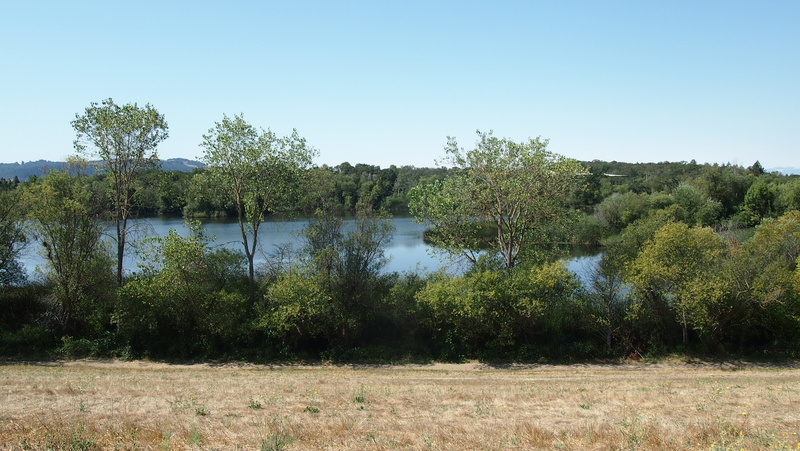 So we split up (he is a seasoned runner and is much faster and can go much further than I can) and I committed myself to running one more lap around the lake. My pace significantly slowed along the way, but I was determined to finish jogging as best I could and not walk the rest of the way (which means, the sooner I’d finish)! 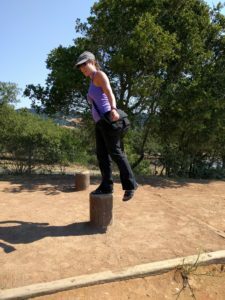 Admittedly, this goes beyond my usual, gentle precaution and care I have for my body and what I practice and preach to my students, and I don’t recommend pushing beyond your body’s signals to its safety limits. 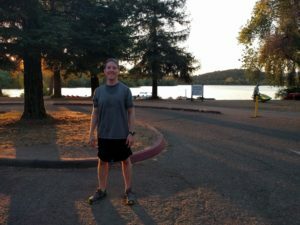 But I will say that this experience humbly reminded me again of my running limitations, as I experienced that hip pain in my last lap around the lake and the next day while walking, and I vowed to myself not to do this again during our travel workouts. However, I was still pleased with myself and felt accomplished for making my goal and giving myself the workout I did! I suggest that you look into Parcourse fitness circuits set up at local parks near you! 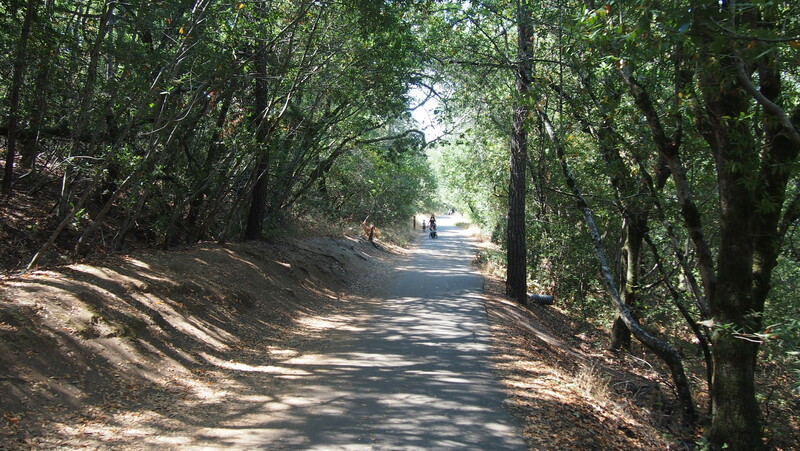 They are FREE and a great way to get you exercising outdoors in a new way! 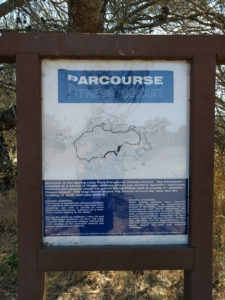 I found a website to help you search to find a parcourse near you. Enjoy, and l’d love to hear about your experience with it!